Fittingly, Les Porteuses d'Ô was released in January 2018, the year marking the twentieth anniversary of the formation of Montreal's Ensemble SuperMusique (ESM). In the years of its existence, the ensemble has explored ways of integrating improvisation with composed music, commissioning over fifty compositions that combine the two. So, it is no surprise that this landmark album features three new graphically-scored compositions which aim to do just that. 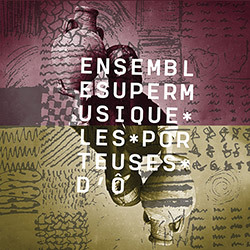 The line-up of ESM has evolved throughout its lifetime, with few ever-present members; of the twenty-six players credited on ESM's debut album, Canevas (Ambiances Magnétiques, 2004), only four feature among the thirteen on Les Porteuses d'Ô — alto saxophonist and flautist Jean Derome, alto saxophonist and vocalist Joane Hétu, alto Jean René and percussionist Danielle Palardy Roger. ESM co-founders Hétu and Palardy Roger supplied two of the album's compositions, the third coming from Vancouver-based Lisa Cay Miller; yes, all three pieces do have female composers. Recorded live in concert, in Montreal, in April 2017, together the pieces run for just over forty minutes, the three being of similar lengths. The album opens with Palardy Roger's 2014-15 piece "En arrivant par le nuage de Oort", the title referring to the theoretical Oort cloud of icy objects, the origin of long-period comets such as Hale-Bopp. Palardy Roger says that "the unfolding of the composition evokes the journey one might undertake between the Oort cloud and the Sun." Of course, the danger of such a statement is that the composition in question is listened to as programme music, with the listener literally interpreting each sound. To combat that, it would be useful to see the graphic scores themselves, but this CD does not include any of them, only their composers' notes on them. Suffice to say that the music feels true to its composer's intention; its soundscape begins with lots of small percussive sounds surrounded by space, and gradually becomes fuller, louder and more intense as it builds steadily to a climax. By comparison, the next piece, from 2015-17, Hétu's "Préoccupant, C'est Préoccupant", is far more garrulous and dramatic. Fittingly, the fifteen-minute track opens with a theatrical drum roll which leads into a prolonged passage of discordant sounds from the nine musicians involved, heralding the arrival of the composer's own voice. From there on, the piece is episodic with that voice dominating. As the composition focuses on four "concerns that can insidiously interfere in our lives", starting with "To Fall from High", there is plenty of scope for expressive outpourings of emotion and angst, including weeping and wailing. The calmer instrumental passages provide welcome periods of respite. The album closes with Miller's 2017 composition "Water Carrier" which (in translation) is practically the title piece. Inspired by the issue of drinking water rights of First Nation communities in Canada, it is wholly instrumental, successfully integrating composed and improvised music. It features some poignantly melodic passages played by the ensemble's strings. These are interspersed with some strongly rhythmic sections and others with a clear jazz influence.